A massive seven days of action at Sydney Olympic Park Athletic Centre with track and field championships on the line for Open and Junior athletes. MUAC has a big contingent of athletes in action. MUAC finished the competition second behind SUAC in the Open point score. Our rivals collected 105 points with MUAC second on 66 and QUT Athletics Club 3rd on 58. 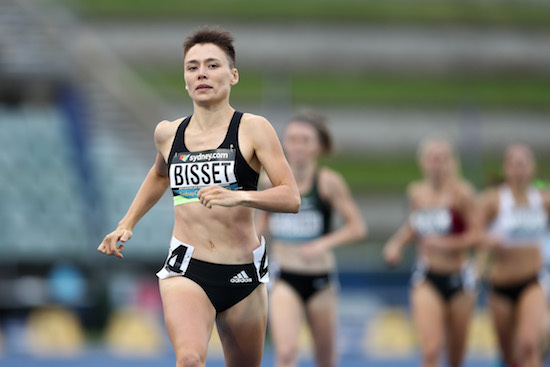 Catriona Bisset booked her spot on the plane to Doha with a sensational run in the 800m, running 2:00.48 Bisset eased her way to the front after 200m and never relinquished control of the race after that. Coming through the bell at 1:00.36 she ran a negative split to hold off Georgia Griffith and Morgan Mitchell, both 2018 Commonwealth Games representatives. 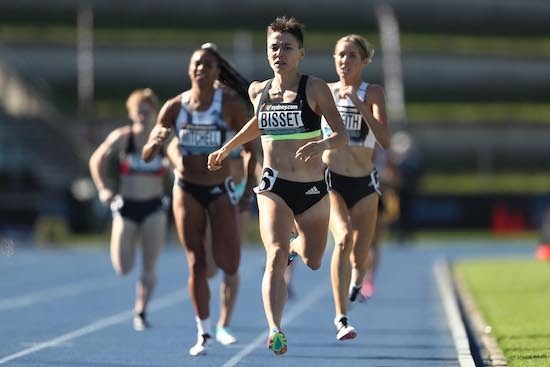 Bisset backed up a couple of hours later to anchor home the Victorian 4x400m team to a gold medal performance. Isaac Hockey continued his strong season of racing, finishing 7th in the 1500m final in 3:46.36 in a tactical race. Stella Radford claimed a silver medal, crossing the line in third in the 3000m steeplechase and putting her in the hunt for Doha selection with a fine run of 10:06.13. Kira Davey continued her fine season racing the 100m hurdles in the lane next to Michelle Jenneke, running 16.17. 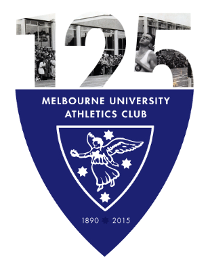 First year Melbourne University student Olivia Jones jumped 1.74m to finish 9th in the high jump. Joel Baden has claimed a surprise IAAF 2019 Doha World Championships qualifier off a short run up on Saturday. Baden, pushed the bar straight to 2.30m after clearing 2.24m and cleared it on his third attempt, with only a 7 step run up. The height is a new PB for Baden and improves his own MUAC record by 1cm. Manjula Wijesekara, Baden’s squad mate cleared 2.15m for 5th place and silver in the Australian Championship, with Joseph Baldwin also over 2.15m and 7th on count back. Sarah Billings (4:16.10) and Georgia Hansen (4:16.45) battled down the home straight to finish fourth and fifth respectively in the Open 1500m after a steady and tactical early race. Matt Scott capped off a good domestic season with 4th place in the Open 800m in 1:47.57, a qualifier for the 30th Summer Universiade in Napoli. MUAC’s three open vaulters all cleared 3.60m with Kath Iannello 7th, Isabelle Napier 8th and Tamara Mancuso 9th. Denis Finegan claimed eighth in the Triple Jump with a performance of 14.93m. Andrew Conkling vaulted 3.80m for 5th in the U18 boys Pole Vault. Catriona Bisset underlined her good form, qualifying fastest for the 800m on Sunday with a strong run at SOPAC. She’ll be one of the athletes to watch in a high quality field. Isaac Hockey, despite some heckling from Tamsyn Manou, comfortably qualified for the 1500m final and will look to clock a Universiade Q and claim a medal on Sunday. Jemima Montag fought hard and took silver in the Australian 10000m championships in 43:51.47. Roman Anastasios, backing up from his fourth in the U20 HJ, won gold in the U18 Championship with a leap of 2.06m. In the Combined Events, Christina Paynter took 6th place, 6638 points, and Liam Schreck 10th with 6270. Kira Davey, MUAC legend, claimed 12th in the Open Heptathlon with 4163 points. Jamieson Battistella backed up her U20 HJ title with a win in the U20 Heptathlon with a point score of 5041. MUAC athletes shone on the first day of Open competition, Thursday, and over the first half of the carnival in junior competition. 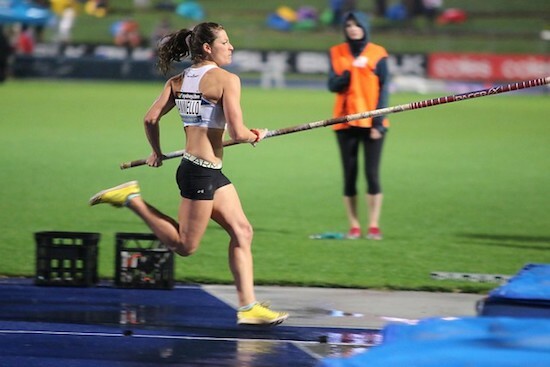 Isabelle Napier, Tamara Mancuso and Kath Iannello all survived terrible Thursday night conditions to qualify for the final of the Pole Vault. 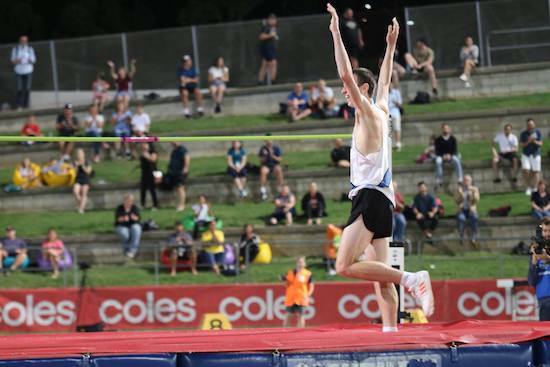 Our three high jumpers Manjula Wijeskara, Joel Baden and Joseph Baldwin all progressed to the final without jumping and will be in action on Saturday night. Both the decathlon and heptathlon saw MUAC athletes in action with Kira Davey sitting 13th after the first day, Christian Paynter, 9th and Liam Schreck, 10th. Victorian 800m Champion Matt Scott survived the cutthroat straight to finals qualifying to make the 800m final with a strong homestraight kick. Sarah Billings and Georgia Hansen looked comfortable in qualifying for the 1500m as well and big things are expected in the final. Olivia Honey ran well to get 4th in the U20 100m in 12.20 and took gold for Victoria in the 4x100m. Roman Anastasios jumped well for fourth in the U20 high jump (2.08m) but will look to go higher and claim a medal in the U18 event later in the championships. Charlie Froome jumped a big PB, his first over 7m to claim the U17 national title with 7.08m. Jamieson Battistella started her nationals campaign in the best possible fashion, winning the U20 high jump with a personal best 1.78m jump and repeating that leap in the heptathlon competition. After the first day she sits in the bronze medal position. More action to come over the next three days.